Have you tackled any of these projects yet? You can see links to the complete series here. In this series, we're seeing what we can make out of 2x4s. I want to keep it cheap, keep it easy, and keep it totally doable for anyone. I know I have a lot of favorite projects, but let me tell you, what we're working on today and tomorrow is my very, VERY favorite project from the whole series. 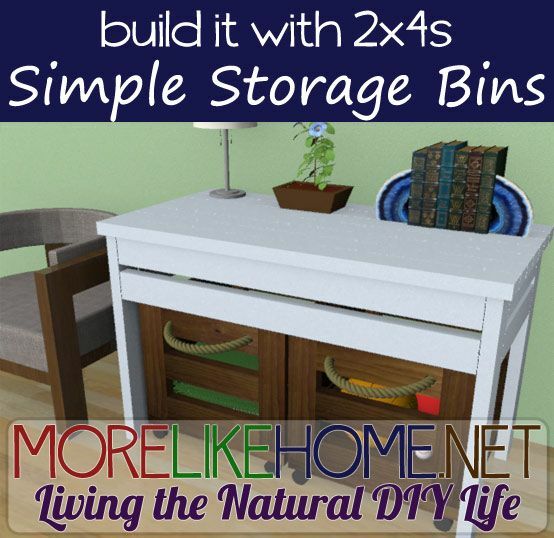 I've split it into two project days and today we'll be starting with the Simple Storage Bin! Please read all the directions before beginning, and cut your pieces as you go, measuring before each cut. Use 2 1/2” screws or pocket holes with 2 1/2" screws unless otherwise indicated. Always use glue. Pre-drill and countersink your screws. I have not built from these exact plans, so measure lots to make sure things work out! Use three front/back boards (B) to connect two of the legs (A) as shown below. One front boards should be flush with the top of the legs, one flush with the bottom, and one centered between with 2 3/4" of space above and below. 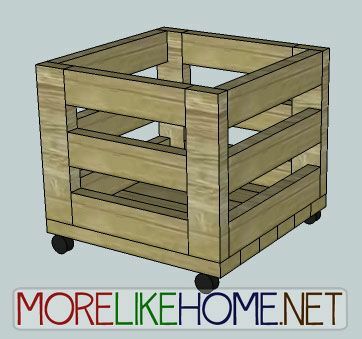 Attach the front boards to the legs using a Kreg Jig and 2 1/2" pocket screws, or by drilling through the legs and into the front & back boards with 4" screws. Use glue. Repeat to build the back section. Now use the side boards (C) to connect the front and back sections you just built. Attach three boards on each side. Everything should be flush across the outside edges. On either side, one board should be flush with the top of the legs, one flush with the bottom of the legs, and one centered in between with 2 3/4" of space above and below it. They will line up with the front/back boards. Attach the side boards using a Kreg Jig and 2 1/2" pocket screws, or by drilling through the legs and into the front & back boards with 2 1/2" screws. Now you can attach the bottom boards to the bottom of your bin. They should sit flush around all the sides. 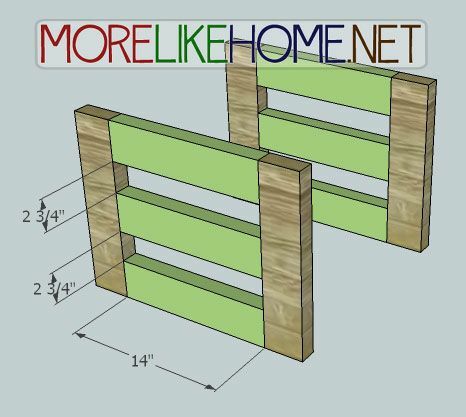 Attach them by drilling through the bottom boards into the sides and legs with 2 1/2" screws and glue. To finish of your storage bin, start by filling any holes and sanding down the entire piece. Now you can finish with any paint/stain/poly you like. Try a nice rustic finish to pair with a sleek table, or a sunny yellow for the kids' rooms. For rolling bins, go ahead and attach a caster below each leg according to the manufacturer recommendations. 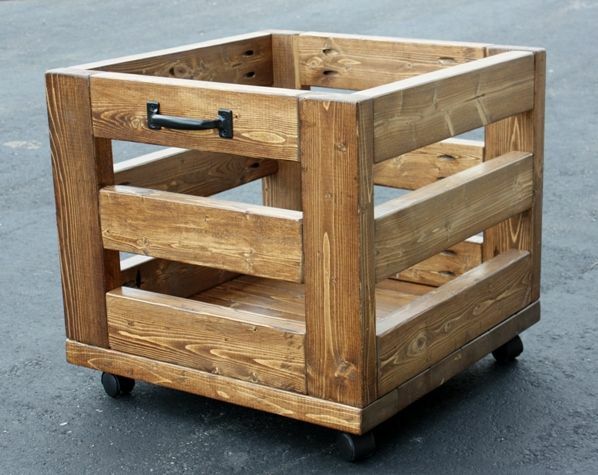 You can also add a drawer pull or rope pull to make your bin easier to move around. 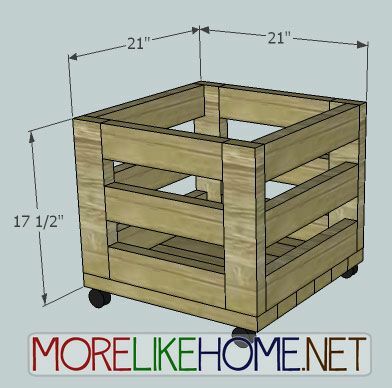 And be sure to come back tomorrow to build a matching Simple Storage Table to pair with your Storage bins! 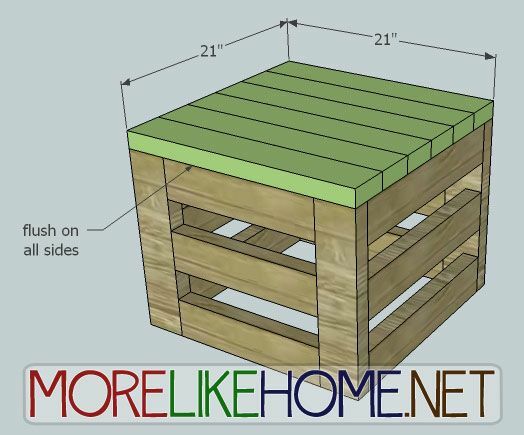 From Val (via ana-white.com): "I love this storage bin from morelikehome.net, and it was easy to build, too!" 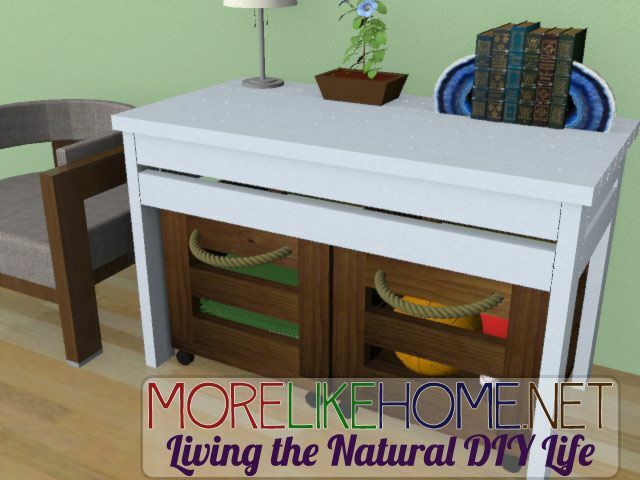 Thanks for sharing Val, I look forward to seeing the Storage Table when you complete it! 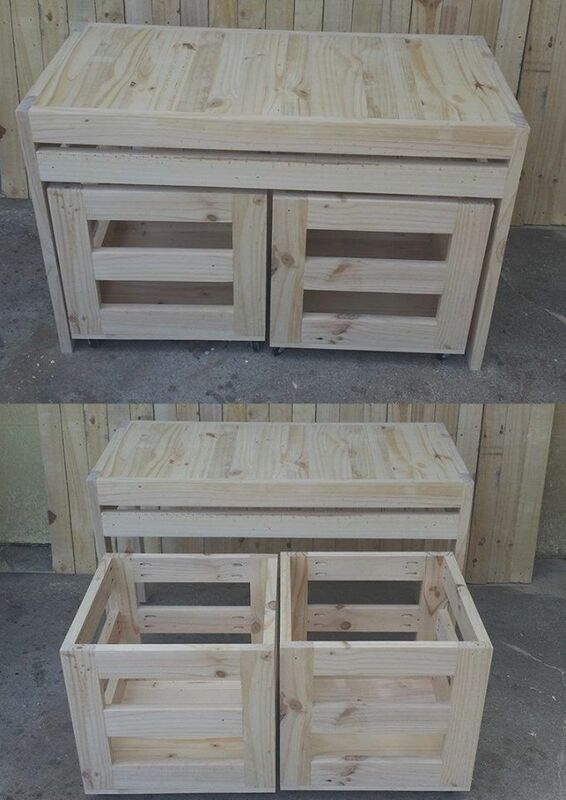 And a big thanks to Alex for submitting these beautiful bins complete with Storage Table! Great work! Looks like a nice place to keep a boy's pig. I would like that in the garage! I like the pulls on those! Love these. I've been looking for something inexpensive for storage for my daughter's room. I may give them a try. Hi Georgia. 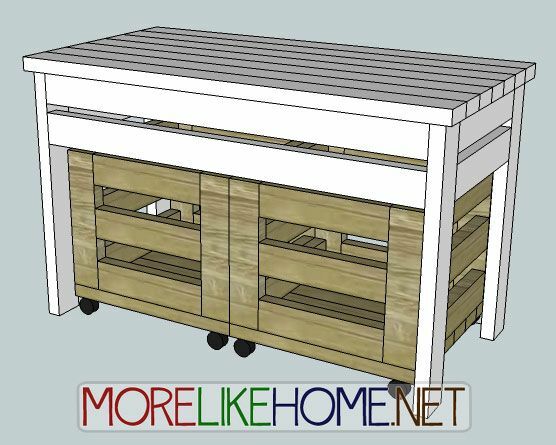 These would make great bins for a garage! Hello Georgia! 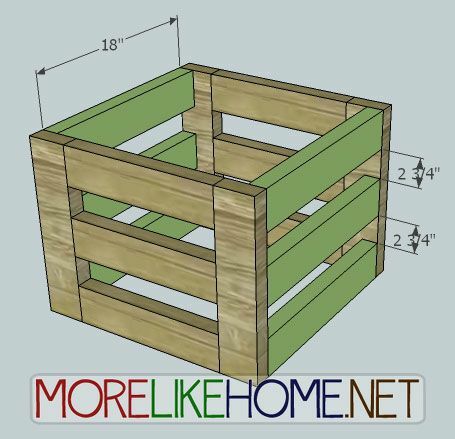 I've just completed my first storage bin from your plans, and it turned out beautiful! It was originally intended for garage storage, but it looks so good stained, it'll be going to my art studio/sewing room instead...which, by the way, gives a whole new meaning to the words "war zone"! The second bin and the table will be in there as soon as I can build them. When they're all done I'll be posting them on Ana White's Brag Board. Hope you have a great day! Val from Alberta, Canada. Wow excellent post.Thanks to write this one.